“SALT LOVE” | Crappy Kitchen - Good Dinners! ← Blood Type A “Diet Experiment” Update AND A STRONG Word About “Diets” !! I thought I would celebrate my 600th post (I know, right!) with a confession. 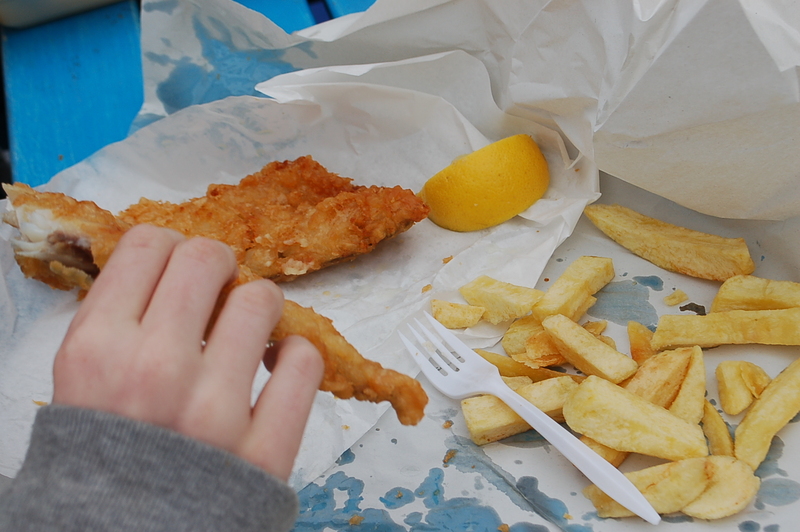 What I want to talk about is an ingredient that people are told to shun left and right – not me however: I love salt! Most people are horrified when I take a pinch of salt and promptly put it into my mouth. My reason for ignoring their admonishment is simple: I feel that if I crave salt then my body must literally be crying out for it – I can’t ignore a cry for help! If I were to play the word-association game and I was given the world “salt!”, what would be the first image that came blasting to the forefront of my mind? Let’s try it shall we: “Tess” (you would say), “What?” (I would reply), “SALT” (you would shout) to which I would shout back, “my Grandmother ” and “Saxa Salt” All very explainable (read on!) and I must admit that this “Jung psychology” may have worked on me in that I thought I would have come up with something a little more evolved considering I think so highly of this glorious and restorative seasoning and medicine. 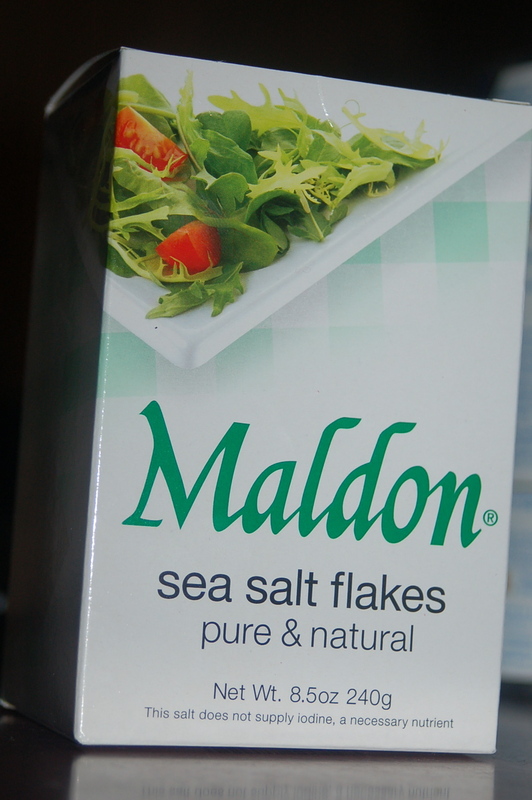 Maldon salt – If I could only have one salt; this would be it! Going to my grandmother’s house was a frequent outing when I was growing up. 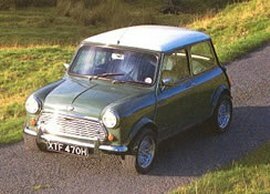 All eight of us would pile (literally) into our mini (Mini Cooper in the United States – plain old “Mini” were I come from!) and travel the six miles to her farmhouse which was located about a 1/2 mile off the main road . It is funny to think now how short the distance was as my memory is of it being a miserably long journey. Now I realize this was probably due to the fact that I was squashed in the backseat and every second felt like an hour! Okay, I could digress as I have a great urge to talk about my grandmother and her house, but let’s leave that for the book shall we and stick to the salt association game. Her kitchen table always has two things on it, whether there was a meal going on or not: a cut glass sugar bowl (“with three stubby glass legs”, which my sister June pointed out to me when I talked to her about her memories of salt last night on the phone! 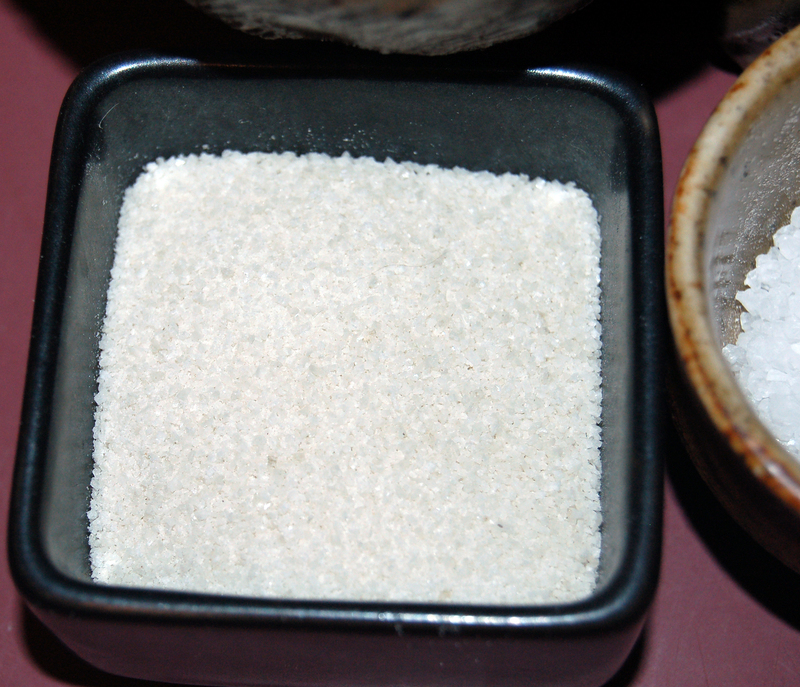 ), full of white sugar which always has a few lumps in it due to using the same spoon to scoop the sugar as to stir the tea, and, a little-cut glass salt dish also full to the brim, which also invariably harbored little lumps of hardened salt crystals. I distinctly remember my father and my uncles sitting down to dinner on Sundays and use their knives to scoop out an ungodly mound of salt onto the tip and store it on the edge of their plate where it was used to conveniently dip each fork-full of food before eating it. The other word that sprang to mind was “Saxa” (pictured below as I remember it in the 1970’s). 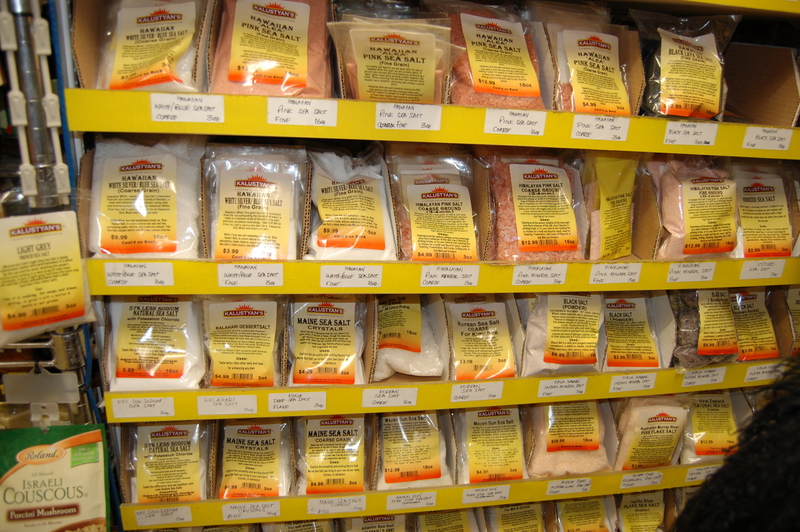 Saxa salt was first sold in 1907 and is still on grocery shelves today. It always sat in the middle of our table at dinner time (breakfast and tea time too no doubt) and by the time this large plastic container of salt was used up, the yellow and white label would become faded due to frequent handling! The salt spout was large and every one of us was an expert at tipping it over quickly towards our plate and not pouring until we each had a tiny white pyramid and we did this before ever tasting our food. I had no idea that this was insulting to our mother by presuming she had not seasoned the dish correctly. She was never offended as she knew only too well that there was always a penchant for a little more salt no matter how much of it she saw fit to use! There was no knowledge of salt being bad for certain people pron to certain health conditions so it was used freely and often. 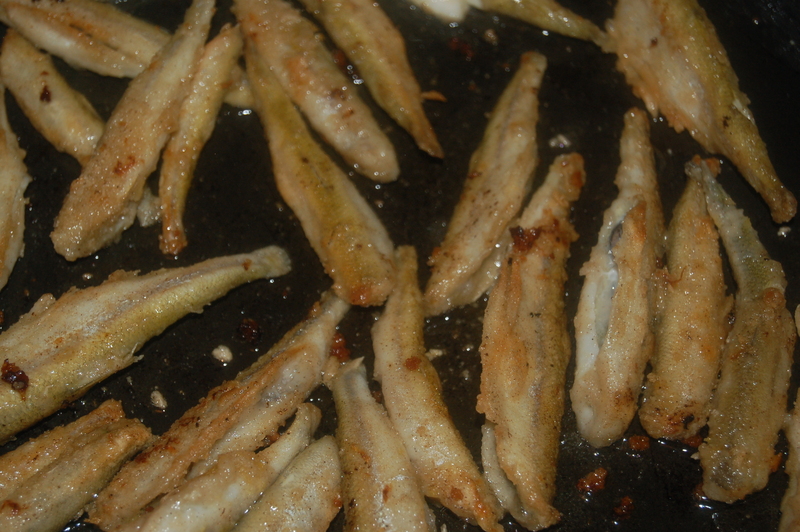 It rescued many a bland dinner and the majority of the time was the only seasoning on hand. 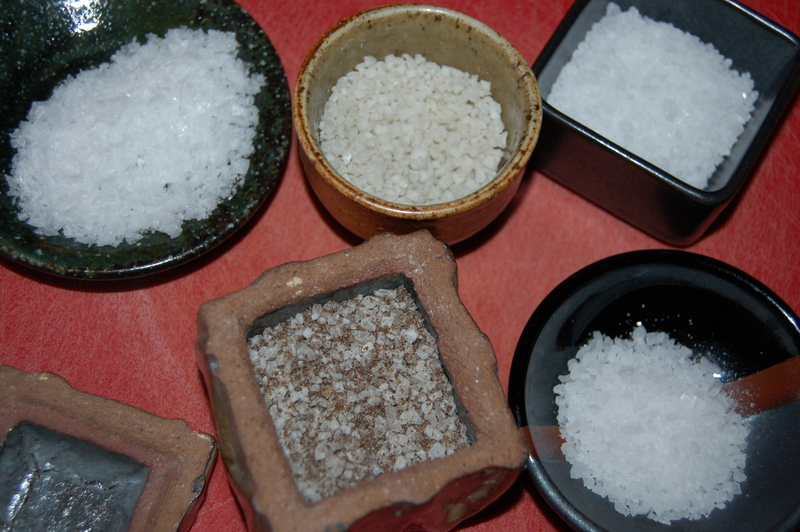 At that time and for a long time later I had no idea how many different kinds of salts there were in the world. I grew up loving a common fine-grained table salt, so you can imagine how excited I was to discover how huge the world of salt really was. 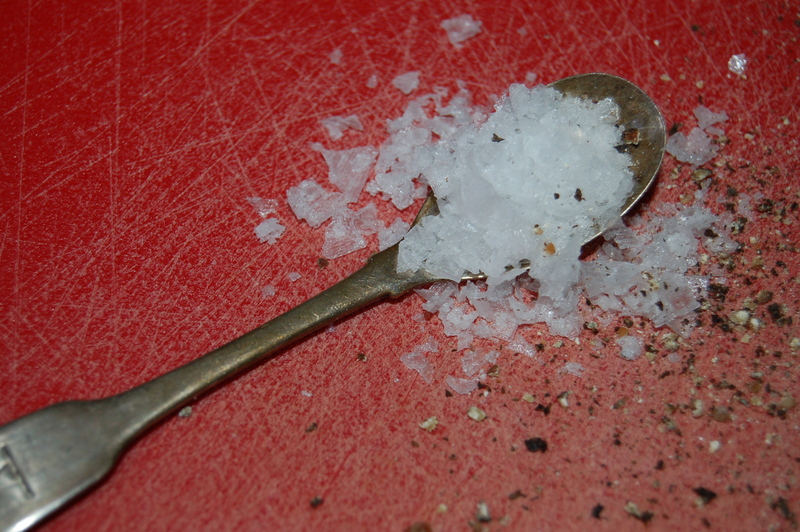 My love for salt has not diminished even with the new-found knowledge of how it can be a downright killer if overused. I am more taken with the fact that you can also die if you don’t get enough of it. I love the whole history of salt and the hundreds of ways it is harvested, stored and used, (I had better not go down that road or this post will never end!). I just cannot imagine the culinary world without it! Have you ever tasted something that was near perfect but no matter how you seasoned it, the taste was still not right…that is not until you added a few grains of the perfect salt and then WOW – something amazing happened and all was right with the world again! The Crappy Kitchen may have only one counter-top from which to cook from, but that hasn’t stopped me from filling it up with dishes of salt for liberal abuse. Right now I have the following varieties: Maldon Sea Salt flakes (always), fine ground Celtic Sea Salt ( I used this for mixing into my mashed potatoes, my scones and sprinkling on homemade popcorn), Sicilian Rock Salt (you might know that I’m in love with most things Italian), Gueronde’s Grey Course Salt (having anything French in the kitchen is imperative), and Dulse Seaweed Salt from Maine (procured from my favorite place to buy condiments in NYC, Kalustyan’s). Because they are within easy reach, I tend to use them all and doing this has helped me to discover how to take best advantage of each of their unique qualities. Two salt that I picked up that day in NYC! I used to think that salt just tasted like “salt” but now I see that what part of the world it comes from, and how it is harvested and stored really plays a big part in how it tastes and how it compliments our food. Growing up only knowing Saxa Salt closed so many flavor doors I never knew existed. That of course is not to say that Saxa Salt does not have a place in my kitchen or in my heart but nowadays it is loved in the company of other great salts. 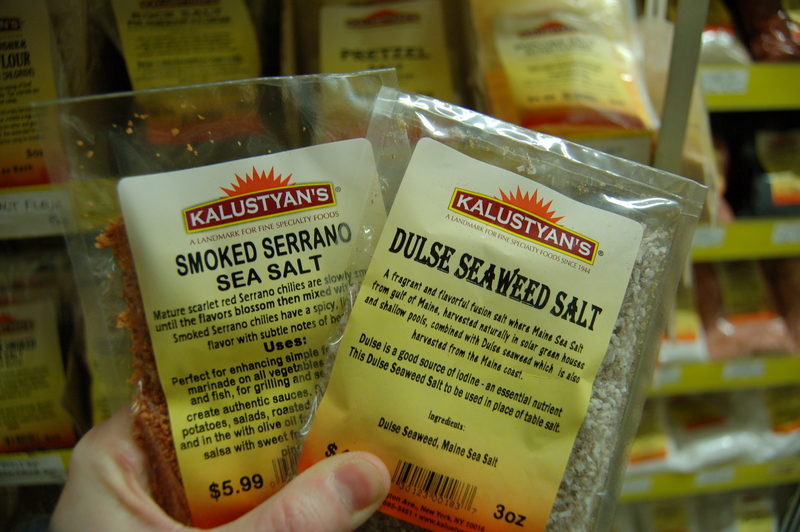 Maldon is a great finishing salt and brings out the brightness and flavors of a cooked dish while something like the Dulse Seaweed Salt is great for seasoning meat for strong dishes like stews and long-cooked braises. This might all seem way too complicated but I assure you, if you knew me you would know that it doesn’t take an expert to figure all of this stuff out. The only requirement is that you have to like spending a little part of your day hanging out in the kitchen making something pleasing for you to eat everyday. If you only have the ubiquitous variety of ground salt from your childhood or from the generic section of your supermarket I suggest you break free and try at least two others, and I guarantee your food will become happier for it. 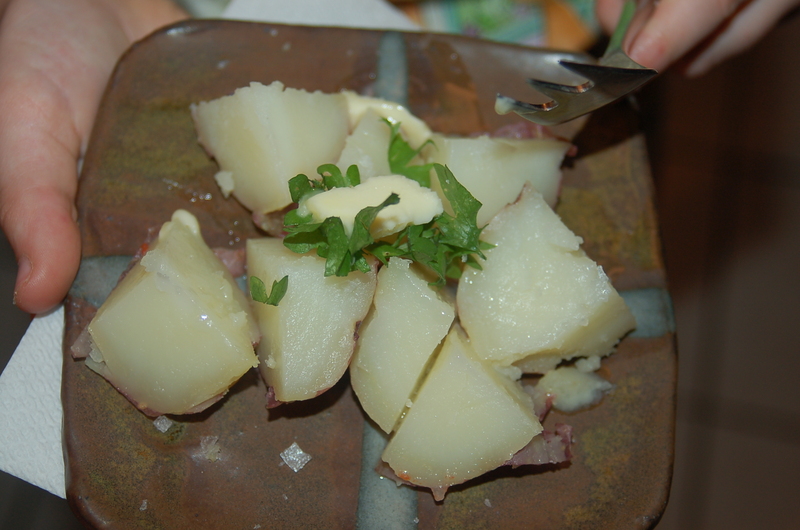 If I had to suggest two, it would be Maldon Sea-salt flakes or Fleur de Sel and Fine Ground Celtic or Italian Sea Salt. This entry was posted in dinners, Ireland, pantry, Stuff I like and tagged celtic sea salt, condiment, course sea salt, dulse salt, dulse seaweed, fine ground salt, finishing salt, fleur de sel, Ireland, maldon salt, salt, saxo salt, table salt, word association game, world salt. Bookmark the permalink. You are so right…. 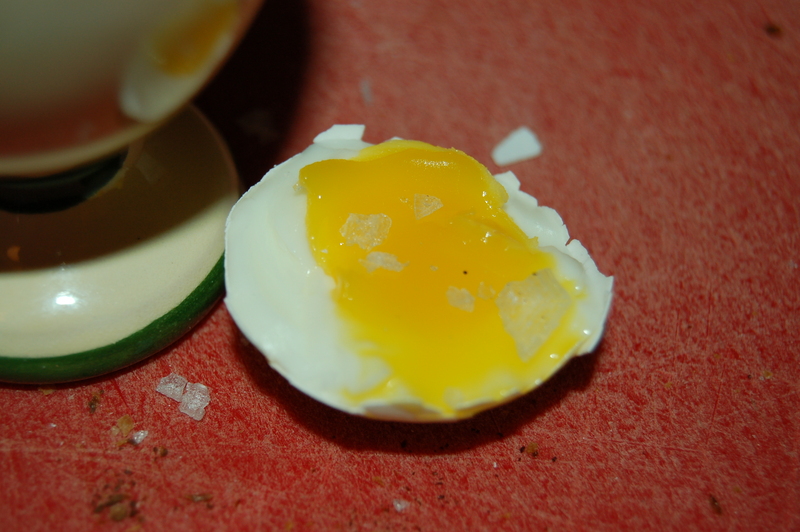 Just imagine a soft boiled egg without salt!? It’s like Laurel without Hardy, Morcomb without Wise …….. Just not funny!